Brie Cheese and Alsace-Lorraine Wine Region. 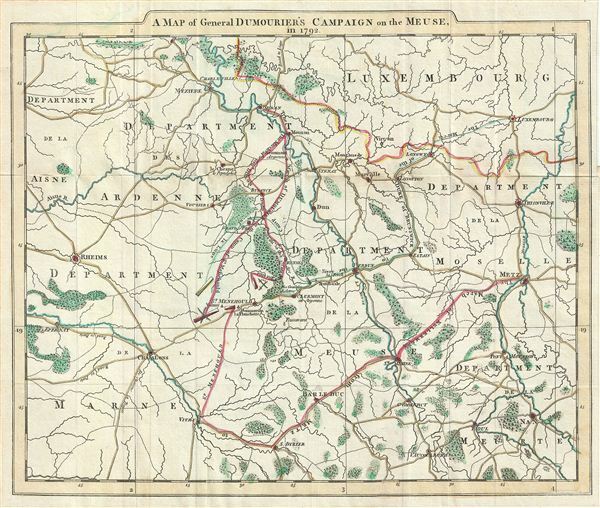 A Map of General Dumourier's Campaign on the Meuse in 1792. This is a scarce example of John Moore's 1797 map of the French department of Meuse. The map covers the department of Meuse along with the neighboring of Ardenne, Luxembourg, Moselle, Meurte and Marne. This area is part of the Lorraine or Alsace-Lorraine wine region. It is also known for its production of Brie de Meaux cheeses. In fact, more than 60% of Brie de Meaux production takes place in Meuse. This map was drawn to illustrate General Dumourier's campaign on the Meuse in 1792, during the French Revolution. The routes of the march of Kellerman from Metz, the march of the Duke of Brunswick to the camp of La Luna, the march of Doumorle, and others are noted throughout. The map also identifies several important towns, rivers, roads, battlegrounds and other topographical details. Published by the Scottish physician John Moore in the 1797 edition of his Journal During a Residence in France. Moore, John, M.D., Journal during a residence in France : from the beginning of August, to the middle of December, 1792. : To which is added, an account of the most remarkable events that happened at Paris from that time to the death of the late King of France, (London) 1793.